Corfu or Kerkyra as the island is called in Greek is the Ionian Island described in superlative. 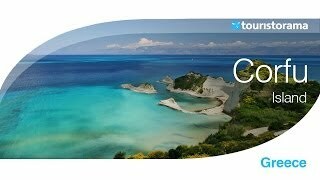 Corfu is the most famous, the most beautiful and the most visited island. The thrilling landscapes along with the noble charm have made it a top destination. Corfu has a great number of hotels offering facilities of high quality and the local cuisine served at the restaurants is almost addictive! For a boost of experience, try it in Easter. The island of Corfu is the land of Phaiakes in Homer’s Odyssey and considered to be the trigger of the Peloponnesian War between Athens and Sparta after a conflict between Corfu and Corinth. Corfu then becomes a part of the Kingdom of Epirus and then is conquered by Romans. In the Byzantine years to follow, Corfu has no important role till the naval forces of the west rise up. Corfu changed hands from Italians of Sicily, Genoa, Venice and Naples but Venetians are those who take Corfu under protection for nearly 400 years. Despite the several attempts of Ottoman Turks to siege Corfu, they fail due to its strong fortification. After the Napoleonic Wars, Corfu becomes a protectorate of United Kingdom until 1864 when it was ceded to Greece. Corfu has a surface of 613,6 sq. km. with a total population of 109.537 residents. Corfu or Kerkira is one of the northernmost islands of the Ionian Sea with the mainland of Epirus of Greece and part of Albania on the east, Adriatic Sea and Italy on the west, the small island of Paxos on the south and the cluster of islands of Othoni on the north. The old city of Corfu has an evident Venetian style with English and French influences. The large esplanade known as Spianada is the largest square in the Balkans and ideal for the starting point of a walk. The narrow alleys of the city are known as Kantounia and the place to rest after this is the Liston arcade facing Spianada with restaurants and cafes. The most famous sight of Corfu is Pontikonisi, a small islet which is located in front of Kanoni with a small church that dates back to the 12th century. Apart from the city there are many villages and beaches to visit with the most popular being: Glyfada, Paleokastritsa, Benitses and many more. The cosmopolitan air of the island still attracts European Royalties with many of them owing summer houses in Corfu. One of them used to be Achilleion, summer palace of Elisabeth or Sissy of Bavaria, Empress of Austria which is now a museum. There is a great tradition of liqueurs in Corfu: Kumquat: is a liqueur from a tasty and small citrus-like fruit, Ginger Beer: is refreshment that was brought by the English, Corfu wine: there are two varieties of white wine produced, Kakotrigis and Muscat. The influence of Italy can be seen even in the local cuisine. pastitsado: beef cooked with tomatoes and pasta, sofrito: beef stewed in white sauce, savoro: fried fish served with rosemary sauce, mandolato: sweet nougat. By air from Athens International Airport or by ferry boats departing from Igoumenitsa and Patra. There is also connection with the ports Saradje Bari, Brintisi, Ancona and Venice in Italy. From April till September. In Easter there are traditional festivities and customs that take place in the old city during the Holy Week. Meganissi is the largest of the islets of Lefkada and the most populated. As Lefkada satellite it is the quieter and more remote version of the island and highly appreciated by yachters and day visitors. It has accommodation facilities with hotels and villas for rent. Paxos is the largest island of the cluster of Paxi and despite its small size it offers a grand Ionian experience. It is the summer destination for those who seek a deeper and quieter experience of the Ionian Islands and the hotels and restaurants along with the lovely beaches of Paxos can offer them.